As Aetna and Anthem fend off flak over their pending mergers, they'll battle criticism from shareholders this week who say they don't divulge the full extent of their political sway. Proposed shareholder resolutions would require the insurance companies to provide detailed disclosures of all direct and indirect political spending. Anthem's shareholder meeting is May 19, and Aetna's is the next day. Both companies, which already lay out their lobbying expenditures in public reports, have railed against the proposals. Anthem's report from 2015 shows the insurer, which is acquiring Cigna Corp., spent $13.5 million that year on state and federal lobbying activities. Aetna, which is taking over Humana, spent $7.7 million on state and federal lobbying activities in 2014, according to its most recent report. Aetna has since dropped out of America's Health Insurance Plans, the industry's main lobbying group. But the shareholders who filed the resolutions want more disclosure on what Aetna and Anthem spend on tax-exempt 501(c)(4) “social welfare” organizations, which are not required to disclose donors and often play a role in elections, as well as business groups. 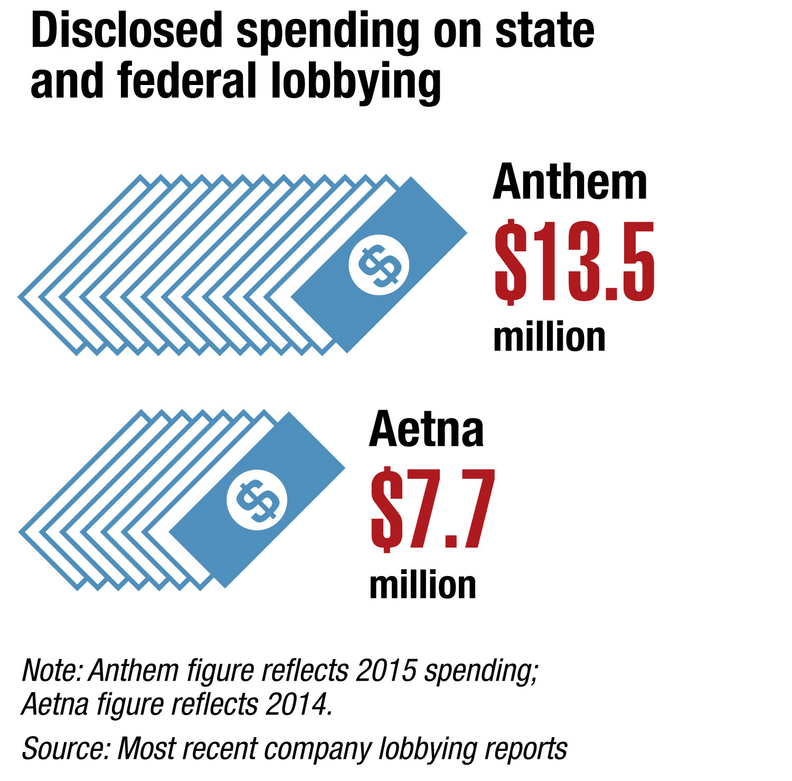 Aetna and Anthem already report what they spend on lobbying, but shareholders want them to shed light on so-called dark money they funnel to organizations with political and business influence. “Our mantra is transparency. If they're not trying to hide something, then they shouldn't hide it,” said Tom McCaney, associate director of corporate social responsibility with the Sisters of St. Francis of Philadelphia, an order of Catholic nuns that filed the resolution against Anthem with the Missionary Oblates of Mary Immaculate and the Interfaith Center on Corporate Responsibility. Spending on so-called dark money groups has mushroomed since the U.S. Supreme Court's 2010 Citizens United decision loosened restrictions on companies and their political contributions. Aetna kicked up controversy in 2012 after the Hartford, Conn.-based insurer inadvertently revealed it funneled millions of dollars to the American Action Network, a not-for-profit conservative organization that qualifies as a social welfare group. The American Action Network has fiercely opposed the Affordable Care Act and has supported right-wing candidates. Aetna and other companies have also used large business and trade groups, like the U.S. Chamber of Commerce, as conduits for political spending. Aetna advocated for its shareholders to vote the proposal down. Anthem called the resolution “unnecessary” since it follows all applicable disclosure laws. The company said in a statement the measure would not be an “efficient use of resources” if it were adopted. Financial analysts are unsure more transparency will lead to a better use of shareholder dollars, but more large companies have moved voluntarily toward further disclosure of their political spending. They see it as a corporate best practice, said Bruce Freed, president and founder of the Center for Political Accountability. Transparency advocates also argue it's a no-brainer for companies to give investors as much information about their operations as possible, especially given the skepticism that surrounds lobbying and backroom dealmaking. The resolutions notably focus beyond what Aetna and Anthem may spend on lobbying. Tax-exempt and dark-money groups could help companies build relationships with elected officials who give them a seat at the table on issues that concern them, Freed said. The chances of the resolutions passing are unclear, although both groups of shareholders have displayed a willingness to file the proposals again if they get turned down.